Is it Your Time to Go Vegan? Going vegan has become mainstream. It has become commonplace to hear different celebrities speak about being vegans or turning to veganism to improve health. Celebrities like Brad Pitt, Ellen Degeneres, Natalie Portman and John Stewart have been vegans for years, and more recently Stephen Colbert kept on a vegan diet for seven months with his wife. That’s the thing. Going vegan doesn’t have to be an overnight lifestyle change, or even a permanent one. Like many things, you can “try it on,” or challenge yourself to eat a wholesome, healthy diet one day per week. What we eat not only has a huge impact on our health, but it can also be a way to lessen our impact on the earth and act on our beliefs. For the last few years, there has been a trend toward cutting back on meat and animal by-products. With these conscious changes in diet, veganism is on the rise. What does it mean to be vegan? Sometimes it helps to have a little history before making the decision to incorporate elements of something into your life, and on your terms. So, before we give you some tips on going vegan, here’s a little background. There are many reasons why someone might want to adopt a vegan diet. For example, Portman, who originally began as a vegetarian at nine years old, turned to veganism seven years ago for both health and ethical reasons. Meanwhile, Colbert stuck to his plant-based diet because of losing a bet. A plant-based diet has been linked to such health benefits as reducing risks for certain types of cancer, type 2 diabetes, high blood pressure and heart disease. When done right, a vegan diet is a healthier way of eating because the whole foods you will eat are loaded with healthy vitamins, minerals, antioxidants and fiber. Being a vegan means believing that all living creatures have a right to live without fear of pain or death at the slaughterhouse. This is because no matter how well an animal is treated during their life, they will experience fear when they come to slaughter. Desire to protect the environment. Producing meat and other types of animal products takes a toll on the environment. Between deforestation in Brazil to growing grain feed for animals to greenhouse gases affecting climate change, reducing dependence on animal products is good for the environment. Meat-heavy diets can be pricey. A review of the price-per-pound of beef, chicken, and fish can put you straight into sticker shock. The grains, beans and foods in a vegan diet often reduce your grocery bills. Plus, you can work to optimize costs by shopping for your produce at farmers markets and other local sources. Following a vegan diet doesn’t mean you are relegated to eating just raw vegetables, nuts and fruits. Today, veganism has become so mainstream that there are many products and meals available in restaurants that fit in with a vegan diet. Vegetarian diets cut out meat, but they allow eggs and dairy. A vegan diet does not include any meat, poultry, fish, dairy, eggs or any foods that contain by-products of such. Honey is another food that is not included in a vegan diet because it is made by bees and using it technically would be exploiting them. Think about it, you can still make veggie burgers and fries, a big plate of spaghetti and more. Plus, there are many dairy alternatives available to assist you with your recipes. If you have friends or family interested, join forces and challenge yourselves together. Your ultimate goal can be whole body health. To stay healthy and get the full nutrition your body requires, you need to maintain a balanced diet that provides you with macronutrients. Adding fermented foods to your diet can help, but kimchi and sauerkraut might not seem all that appealing to all. In fact, there are many other palatable solutions. 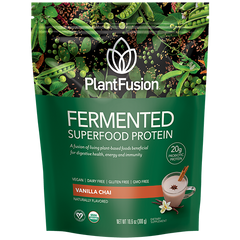 PlantFusion offers one; think of it as your first step into trying out a vegan diet. If you haven’t considered trying a plant-based diet before, why not give it a try now. A good way to start is to begin a simple five-day vegan challenge with your significant other or a friend to see if going vegan is right for you. 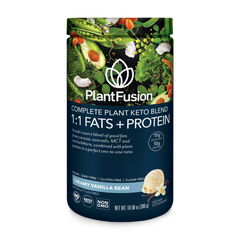 Certified vegan and 100% plant-based products from PlantFusion are loaded with macronutrients that will help you with making sure you’re getting the nutritional support you need during your transition to veganism and beyond.